Dr. Richard touched down in Dallas for a few days this week to take care of a few important “home front” details and is now in Washington, D.C. for the National Prayer Breakfast. Then, the Lord willing, he will be off to Thailand for the first full set of GProCongress core team meetings onsite in Bangkok. Please pray for God’s clear guidance and provision during these engagements. Registrations for the Congress continue to move forward steadily; pray for news of the GProCongress to keep spreading. Some are just hearing of it; we are still praying God will bring the right pastoral trainers, up to 5,000, from all different areas of the world. Also ask the Lord to inspire and provide for the many from difficult circumstances who wish to attend. Thank you for remembering Dr. Richard’s family in prayer, as well. Please intercede for special protection, provision, direction, correction and connection over each, from Bonnie, Ryan, Robby, Nathalie, Joshua and Emma, and Sitara, to his father, Dr. John Richard, and siblings. Pray that their love for the Lord Jesus Christ will grow and that He will be glorified through them. Thank you! 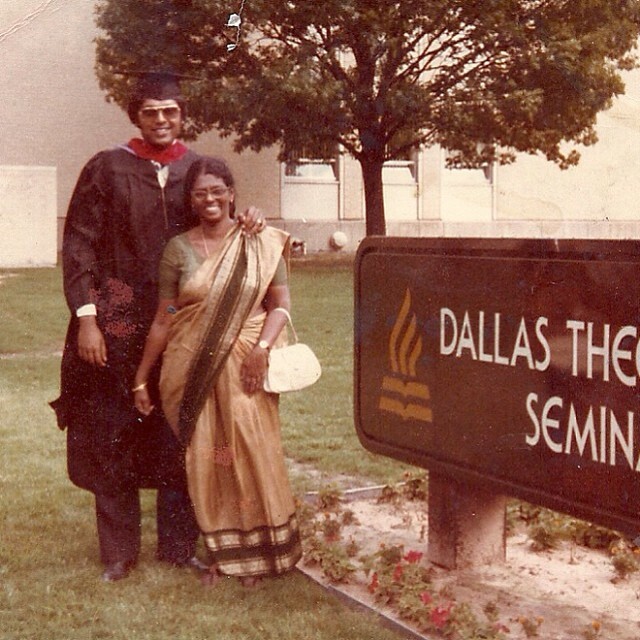 Dr. Richard and his mother, Manorama (Mrs. John) Richard, at his Dallas Seminary graduation. Manorama Richard was born on April 9, 1924, in Salem, Tamil Nadu, India to Mr. & Mrs. Masilamani Mudaliar. Having personally embraced the Lord Jesus as her personal Savior in 1957, she wished to share God’s salvation to all her immediate and extended family. She lived her early years in Secunderabad, A.P., was educated in Chennai and Delhi, and then married David John Richard on May 31, 1950. After the birth of their son Ramesh, they moved from Hyderabad to Chennai for her husband’s employment with the Indian Airlines. Ramani, Ravi, and Rajiv were added to the family there. She would personally lead all four children to salvation in the Lord Jesus Christ. Called to serve with her husband in full time vocational ministry, Manorama and her family moved to New Delhi in 1972. After fruitful worldwide service, the Richards immigrated to Syracuse, New York, in 1991 and to Richardson, Texas, in 1995. The core Richard family includes four children, eight grandchildren, and six great grandchildren. Please join us in praising God for Mrs. Richard’s life, which was marked by a devotion to God. Also, please hold her family up in prayer. Mrs. Richard’s memorial service will take place this evening in Richardson, TX. In southeast Asia, Dr. Richard was to take part in important meetings regarding the 2016 Global Proclamation Congress for Pastoral Trainers and also teach at GPA Myanmar. Two RREACH representatives attended the Congress meetings on Dr. Richard’s behalf, and have reported the meetings are completed and were mutually encouraging. Praise God! GPA Myanmar is underway with 25 fine young pastors from across the country attending. Please pray for the pastors who are attending, that their ministries would be strengthened and changed because of their time at GPA Myanmar and that the Lord would provide immediate opportunities for them to multiply their training to other pastors in their communities and regions.